"This is one of the most exciting times of the year in Branson and that is especially so for Branson Shows," said Annette Wood, the Director of Sales and Marketing for the Branson Tourism Center. "Each show is like a wrapped present under the Christmas tree waiting to be unwrapped and bring joy and happiness," she added. Read entire article here. 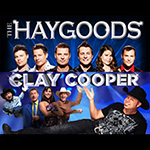 It's a Clay-Goods Jambor-Eve...the name alone tells you this is going to be one fantastic New Year's Eve show! This sensational holiday package includes two tickets to the Clay-Goods Jambor-Eve...that's two huge acts together in one night on one stage! 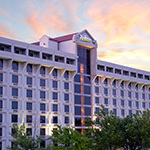 You'll stay at the beautiful Radisson Hotel for three days and two nights - right in the heart of Branson on The Strip! You'll also get a handy Branson Guest Card Savings book. And don't forget to check out the wonderful array of holiday packages just for you! 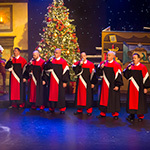 Just click here and get ready for Branson for the holiday season! View packages here. Blasting through the past with the Rankin Brothers is a "blast!" I spent the evening of Oct. 30 "blasting through the past" at the Rankin Brothers show and, excuse the pun, had a "blast" and from the opening note of the Bob Seger hit, "Old Time Rock N Roll" to the last note of Chuck Berry's 1958 classic, "Johnny B. Goode," what a blast it was! 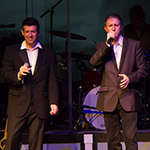 Over 40 numbers from the 50's through the 90's, each impeccably performed and rekindling memories of some of the greatest moments in music history, presented in that special personable Rankin Brothers style. Read entire article here. On Nov. 11, Samantha Fanelli Public Relations US for trivago.com announced that, as a result of their analysis of lodging costs in cities across America, Branson is one of "the 50 Best Value Cities for the coming year." Among other things, one of the primary areas of analysis was "the annual average price of a standard double room." Read entire article here. In a "review" of the Branson show SIX I wrote in May of this year I said, "As many times as I have seen this amazing show... I find myself looking for the band that is not there. 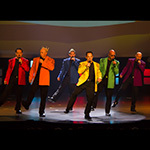 This, even though I know that every sound I hear comes from the six human voices of siblings, Barry, Kevin, Owen, Lynn, Curtis and Jak Knudsen who make up the entire cast of one of Branson's hottest shows, SIX... Read entire article here. "Those coming to Banson for Thanksgiving will have a wonderful choice of places to 'feast' and eat on Thanksgiving," said Annette Wood, the Director of Sales and Marketing for the Branson Tourism Center. 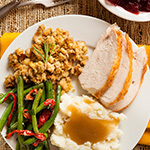 She points out that whether it's nontraditional Thanksgiving fare such as northern Indian cuisine at the India Clay Oven or the more traditional Thanksgiving fare served at a special Thanksgiving Day Buffett in the Stage Door Restaurant at the Welk Resort, and just about everything in-between; there is an unbelievable variety of Thanksgiving meal choices from which to choose. Read entire article here. 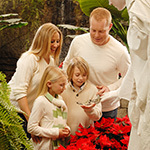 "White Flight" ensures a Branson "White Christmas"
"'White Flight' at Branson's Butterfly Palace & Rainforest Adventure adds new meaning to the term 'White Christmas,'" said Annette Wood, the Director of Sales and Marketing for the Branson Tourism Center. "It's another of those special Ozark Mountain Christmas activities that makes Christmas in Branson a special experience," she added. Read entire article here.